We have already talked about the subject of refitting on these pages, looking into the reasons behind an owner preferring a used boat adapted to his own needs, often turning the concept of the original project upside down. We have mentioned vintage boats that have been completely rebuilt, working boats adapted for yachting and boats whose fame is due to their former owners or to events in which they played a leading role; their historical value meaning they are given due care and attention. This time we want to discuss boatyards specialising in this kind of activity, that is, those able to restore a schooner's original splendour or to turn a tug boat into a comfortable luxury yacht. There are only a few boatyards in the world known for their skills in this specific sector, Astilleros de Mallorca amongst them. The company was originally set up in 1942 with the name of Astilleros de Palma S.A., in the port area of Palma de Mallorca. Astilleros de Mallorca has always been involved in the provision of assistance and maintenance to important boats and the yard also used to build new boats until 1990, when they stopped this activity to concentrate exclusively on growing refitting work. The yard produced about 200 boats - including fishing boats, tenders, dredgers, sailing ships, tankers and yachts - some of which are still in use today, like the largest schooner built since the 1930's. 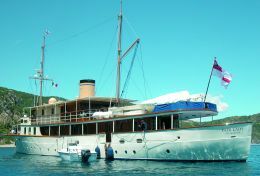 At present Astilleros de Mallorca enjoys a particularly high reputation on an international level for work carried out on yachts between 30 and 65 metres in length. It is no coincidence that 80% of the boats handled by the yard over the past ten years are registered or come from non-EU flags and harbours, yachts that came to Palma de Mallorca solely because of the presence of this famous boatyard. Further proof of Astilleros de Mallorca's expertise is provided by the numerous top-level refits they carry out each year - i.e. those with a value greater than 30% of the boat's original cost. Each year more than 100 superyachts are entrusted to the care of the Iberian yard; some of which undergo ordinary maintenance, but most of which have complex work done on them, including transformation of the boat's original intended use. Astilleros de Mallorca carries out all the different kinds of work inside its own yard, collaborating with companies in the same area who provide technology, materials and technical personnel specialised in the working of each individual component. 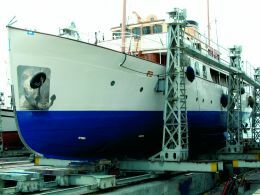 The boatyard has its own workshops for carpentry, steel, aluminium and all the on-board metalwork, engine and transmission, electronics, electrical systems, rigging, sail repair and any other kind of work necessary on a superyacht (whether sail or engine powered), a vintage boat, or an ex-merchant-ship requiring conversion. Astilleros de Mallorca's premises extend over 220m of quayside equipped with a 10,000kg travel lift, as well as others (25,000 , 10,000 and 5,000kg) located on the mainland, four slipways, of which two are 74m long with a capacity of 1,700,000kg, one 63m long with a capacity of 800,000kg and one 6m long with a capacity of 400,000kg. There are also 3,650 square metres of space reserved for work on smaller yachts up to 25,000kg tonnage. Each yacht undergoing work can count on 220 or 380V 50Hz mains power, a telephone line, and fax and email in the boatyard's offices. We paid a visit to the yard last spring and were amazed not only by what we have tried to describe in these few lines, but also by what was on show while we toured the facilities. We were also struck by the technical office's enormous archive where we found designers, engineers and architects carrying out daily research into solutions capable of satisfying the most unusual requests. The most awe-inspiring fact was the incredible amount of information stored relative to thousands of yachts and their accessories, Astilleros de Mallorca's technical office is able to propose suitable solutions for every type of boat and requirement, both for furnishings and for all the technical equipment to complete the job. 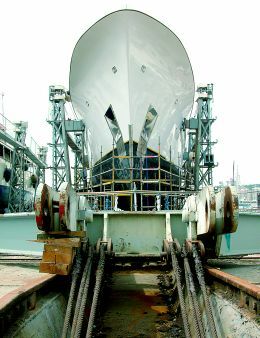 The yard has efficient network connections with companies all over the world operating in the boat sector, enabling it to retrieve information and materials for any kind of requirement. One of the latest works recently completed by the yard is the 52.75m motor yacht "Passion", formerly "Destiny of Langdawi", which required 22 months' reconstruction work, in order to comply with SOLAS regulations and BV rules. This challenging refitting operation involved the structure and superstructure, fixtures, engines, control room and all the interiors.